An indigenous LCA Tejas at the Aero India show in Bengaluru on February 21. IAF placed its first order for 20 LCA Tejas fighters in March 2005, of which 13 have been delivered till date. Express Photo. On February 16, the Pokhran firing range in the deserts of Jaisalmer rumbled with the sound of munition fired by jets of the Indian Air Force (IAF). This was part of Vayu Shakti, an exercise to demonstrate the force’s firepower, and featured all the fighter and transport aircraft, helicopters and missile systems in its inventory. Coming barely two days after the Pulwama attack in which a Jaish-e-Mohammad recruit rammed an explosive-laden car into a convoy killing 40 CRPF personnel, the symbolism of this exercise was telling. And the speculation ended 10 days later when in the early hours of February 26, IAF fighter aircraft struck Balakot in Khyber Pakhtunkhwa, deep inside Pakistan. Their target was a cluster of four buildings inside a Jaish training camp. The IAF sent 12 Mirage-2000 aircraft, accompanied by four Sukhoi Su-30 fighter jets and other supporting aircraft, which fired five precision-guided munition, believed to be the Israeli SPICE 2000 bombs. A day later, the Pakistan Air Force (PAF) attempted a retaliatory strike on military targets in Rajouri sector near the LoC. The IAF promptly scrambled its MiG-21 Bisons and Sukhoi Su-30s. In the engagement, the IAF lost a MiG-21 Bison and Wing Commander Abhinandan Vartaman had to eject on the Pakistani side of the LoC. But the Indian side said that before coming down, Abhinandan had got a Pakistani F-16, which had fallen inside PoK. That was spectacular by any standards of air warfare. 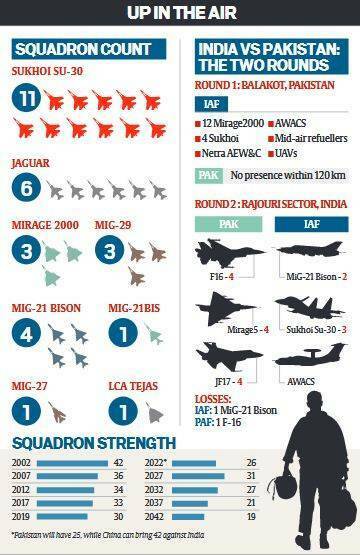 The IAF’s assessment is that it needs 45 fighter jet squadrons (a squadron is 18 aircraft) but is authorised only 42. Against this, it has only 30. As China helps upgrade Pakistan’s military hardware and sees its role as a “strategic weapon” in the region, the IAF’s expansion plans acquire renewed urgency. But this isn’t just about arithmetic, it’s also about the quality of aircraft and the kind of weapons. After Kargil, Pakistan’s F-16s acquired the AMRAAM missile. That’s why the Rafale with its Meteor missile is seen as a “game-changer”. 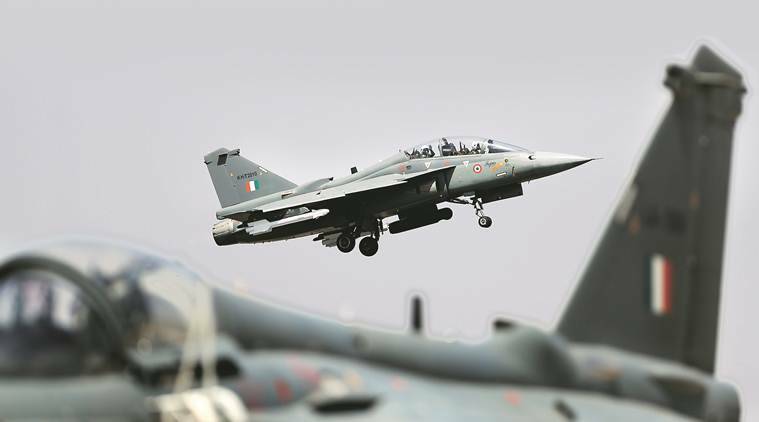 While the indigenous LCA Tejas aircraft are being inducted, the IAF will have to be prepared to operate at higher rungs of the escalation matrix — as established after the Balakot air strike. The IAF chief then went on to explain the context in which the Bison was called in. “One is a planned operation… like the first strike (in Balakot). Was any Bison used in that? Our best aircraft were used… But when an adversary does a strike on you, every available aircraft goes in… All aircraft are capable of fighting the enemy,” he said. Between the lines of the Air Chief’s response is spelled out the IAF’s new challenge: the state of its fleet of fighter aircraft. According to a directive issued by the government — the last one signed by UPA defence minister A K Antony — the defence services are mandated to be prepared for a two-front collusive threat. Simply put, it means that the IAF should be able to defeat any Pakistani threat from air on the western front while being able to hold the Chinese air force on the northern front at the same time. The IAF has assessed it needs 45 squadrons of fighter jets — there are around 18 jets in a squadron — to do this job well, but is authorised only 42. Against this 42 squadrons, the IAF currently has only 30 squadrons (see box). The last time the IAF had the full complement of 42 squadrons was in 2002, just after India had mobilised its forces against Pakistan following the attack on Parliament. Since then, the numbers have steadily fallen and are projected to come down to 26 squadrons in 2022 and 2023, when six squadrons of old MiG aircraft will be decommissioned. The only increments by then will be one squadron each of the French Rafale and the indigenous Light Combat Aircraft (LCA) Tejas. For the IAF, having only 26 squadrons in 2022 raises questions of capacity and effectiveness. For one, the PAF is projected to have 25 squadrons at the same time. And the Chinese Air Force as many as 42. But it’s not just about arithmetic. The Chinese are already expanding their capacity to deploy more combat air resources in Tibet. Pakistan, by virtue of being a close ally of the Chinese, now gets more of its military hardware from Beijing, and the PAF can further augment its numbers by inducting the JF-17 fighter aircraft it has jointly developed with China. The decreasing number of squadrons isn’t the only challenge for the IAF; it is also the quality of aircraft in service or to be inducted. 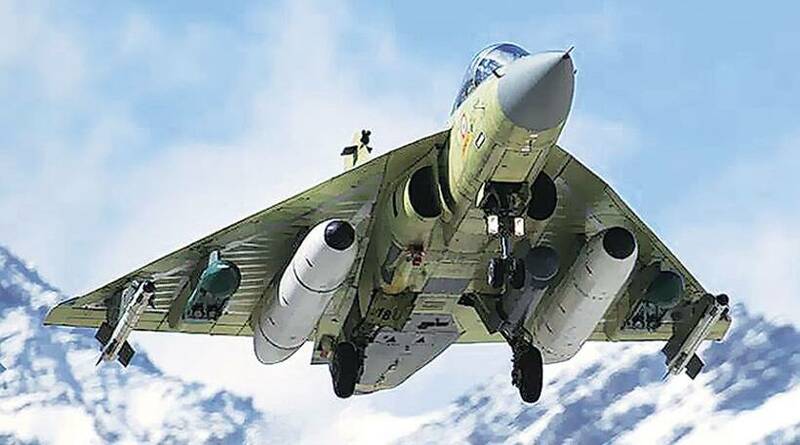 Among them is the LCA Tejas produced by the State-owned Hindustan Aeronautical Limited (HAL), which has been mired by delays, earning it the IAF’s ire. The IAF had placed its first order for 20 LCA Tejas fighters in March 2005, of which 13 have been provided till date. Another 20 fighters are expected to be supplied by 2023. However, considering HAL’s delays, it’s not clear how this deadline will be met. An IAF fighter pilot, who has also trained young pilots, explained that this lesson was driven home by the February 27 aerial engagement over Rajouri. “Given that we are a professional force, Pakistan’s F-16s fired multiple AMRAAMs but only one got the target. We also got one F-16, which was a near miracle. Their other missiles missed the Sukhois, our best aircraft, because our pilots are good and we were able to avoid any hit… To put it in simple terms, we needed to put two Sukhois against each F-16 to avoid these hits. If we had the Rafales with Meteor missiles, the roles would have been reversed. Pakistan would have to put out two F-16s for every Rafale with Meteor,” he said. “When I was flying in the Kargil war, this was not the situation. Pakistani F16s did not have the AMRAAMs then, and we had better missiles. They got AMRAAMs in 2011 and that has put us at a disadvantage, which will be fixed by the Meteor missiles,” he said. This is the reason senior IAF officers are batting strongly for the timely induction of two squadrons of Rafale aircraft. Air Chief Dhanoa called Rafale a “game changer” at his annual press conference last October. The IAF’s requirement for modern aircraft and state-of-the-art weaponry is not a recent one. Two decades ago, in the aftermath of the 1999 Kargil war, it had formulated a plan to replenish its fleet. The roadmap envisaged more fighters in the “medium range, medium weight and multi-role” category, with the same basic performance as that of the Mirage 2000, which had performed exceptionally in the icy heights of Kargil and Drass. It was around the same time that Dassault Aviation, the manufacturer of Mirage 2000, informed the IAF of its plans to wind up its production line for that aircraft in favour of Rafale. The IAF thought that acquiring the Mirage 2000 production line and manufacturing them in India under a licensed production would plug the gap. So, in August 2000, the IAF proposed to acquire 126 Mirage 2000-II — an upgraded version of Mirage 2000 — for induction into service, starting 2004. It also proposed that two squadrons be directly procured from Dassault Aviation and the remaining be licence-produced by HAL under transfer of technology. 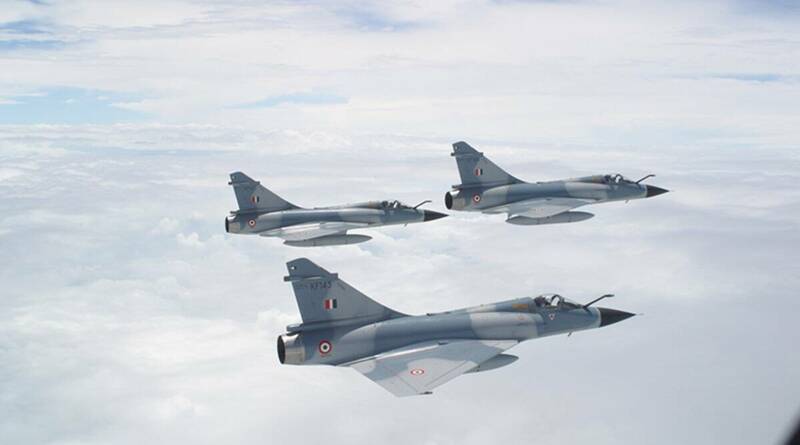 At least thrice, during the Vajpayee-led NDA government’s term, the IAF’s proposal to procure the Mirage 2000-II from Dassault was rejected by the Defence Ministry. In January 2004, the ministry finally discarded the proposal and directed the IAF to start a competitive tendering process. This led to the IAF tendering for 126 MMRCA jets in 2007. At the end of a stringent selection process, in 2012, Rafale fighters were chosen by the UPA government. Three years later, during his visit to France in April 2015, Modi announced India’s intention to buy 36 Rafale aircraft in “fly-away” condition. A few days later, then defence minister Manohar Parrikar announced that the earlier deal for 126 aircraft — stalled over price since 2012 — was dead. The deal for the 36 aircraft was signed on September 23, 2016, which is what has now snowballed into a political controversy for the NDA government. While 126 Rafale aircraft under the old tender made for seven squadrons, the new deal for 36 fighter jets will be worth only two squadrons. In 2016, Parrikar had also announced plans to buy 114 single-engine fighter jets from a foreign country, with 96 of these to be made in India by the foreign company. Swedish Gripen and the American F-16 were among the major contenders. The plan was to have two squadrons of the high-end Rafale by 2022, along with six squadrons of the single-engine fighter by 2032. But in December 2017, the IAF suddenly decided to discard the plans for a single-engine foreign fighter and instead decided to place an order with HAL for 83 LCA Tejas Mark-1A, an improved version of the LCA Tejas fighter jet. The contract for LCA Tejas Mark-1A, with five additional capabilities over LCA Tejas, has not been signed yet. Negotiations between HAL and the IAF have been stuck, putting a huge question mark over the IAF’s plans to have six squadrons of LCA Tejas by 2027. From 2027, there are plans to develop and manufacture LCA Tejas Mark-2, a completely different aircraft, so that the IAF has three squadrons of the Mark-2 by 2031. Eventually, the IAF plans to have 18 squadrons of LCA Mark-1 and Mark-2. India is also developing the next generation Advanced Medium Combat Aircraft (AMCA) and the IAF expects to have its first squadron in service by 2032. Should all this work out, the IAF will have 37 fighter squadrons in service by 2032 (instead of 27) and 34 squadrons by 2042 (instead of 19). But these are still plans, and as the old military saying goes, the first casualty in a battle is the plan. Are there lessons to be learnt from the recent aerial engagements between the IAF and the PAF? 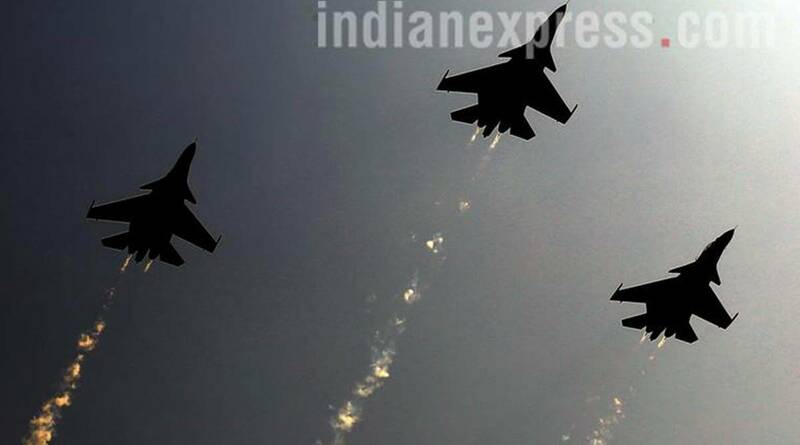 All top IAF officers contend that the air strikes at Balakot were perfectly planned and executed near flawlessly. They dismiss the controversy over crossing of the LoC or number of terrorists killed as inconsequential. The IAF also sees the success of its recent operations as a validation of its two major exercises — Vayu Shakti and Gagan Shakti. While one tested the number of fighter aircraft the IAF can summon in case of a conflict, the other its ability to hit select targets of the enemy. The professionalism on display during the recent strikes, officers say, emerged directly from these exercises. “We have always known that we have better staying power than the PAF. We can be in the air or in the air defence role far longer than they can ever be — it is a simple question of resources. We also have better stamina as a bigger country and that will always be an asset,” an IAF officer explained. Though the use of air power between two nuclear-armed countries is inherently escalatory, Balakot, the IAF believes, has shown that air power can operate on rungs of the escalation ladder well below the threshold. That should make the IAF an attractive and viable option in any such situation in the future.